Join the discussion on our forums! Come discuss Sandbinder over in our dedicated Sandbinder discussion topic. Battlecry: Draw an Elemental from your deck. Turns out selective draw is really good, especially since elementals tend to be good cards, particularly in even shaman. Why is his nose that red? Hmm... Maybe running this guy in Priest to draw Lyra the Sunshard? cards synergies with leyline are , simularcrumed arugal , original arugal , simulacrumed/Arugal generated Sorcerers apprentice. or the arugal generated leyline . there is a combo as well with the banker card + the witchwood piper and also book of spectres. It does it's purpose but its understates and it throws off the flow of actually playing other elementals to trigger elemental effects. This is it really. It's not for Elemental decks, it's for pulling that one or maybe two cards that you need to make your deck work. A bit of a bummer from an Elemental deck perspective but allows for some interesting builds. Hope the Flavor Text will be: He doesn't like sand. It gets everywhere. 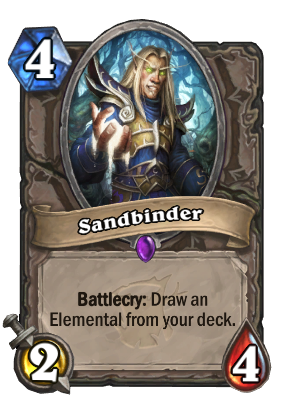 This is a nice balanced card, so sadly no one is going to play it since they're used to the ''8/8s for 5, Battlecry:gain 10/10, deal 6 damage to all enemies, draw 3 cards and discover 2 elementals if you've played an elemental last turn.'' cards. Oh, yes, it also doesn't have lifesteal when in mage since it isn't an elemental. It’s a pretty good card. Especially, if you need to draw Lyra the Sunshard for your combo. Sadly, it’s hard to build a combo Priest deck without Radiant Elemental, which is also Elemental. Still, this card is better than nothing. Literally just a Gnomish Inventor for elementals. I don't think it's that strong, but if you really want to draw an elemental, sure I guess? Don't know why you'd want one so badly though unless for some super janky combos. Effect is great, cost not really. Still playable anyway. "Witchwood feels a lot like sandwood right now"
It is also good in shaman and can be ok in priest.